Ventura’s SPARC MGS automatic digital watch has just been awarded with the red dot “BEST of the BEST” design award 2012 by the red dot Design Center Essen. This is not Ventura’s first red dot, having also received the Best of Best in 1995 for Hannes Wettstein’s v-matic Chronometer. The red dot award started in 1955 and is one of the world’s largest design competitions, attracting more than 14,000 entries from over 70 countries every year. In 2012, some 1,800 companies and independent designers from 58 countries registered to compete in the “red dot award: product design” in nineteen categories. 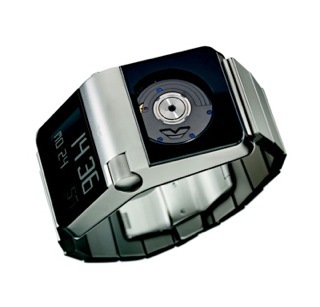 Designed by Simon Husslein, the creative Director of Studio Hannes Wettstein AG Zürich, the SPARC MGS was not the only Ventura items that were up for consideration; the BRAUN Digital Watch BN106 and the belt “Gents & Belts” Preciluxe, also designed and produced by Ventura and garnered themselves a red dot. Here’s a short video about the Sparc MGS.